Always being caught out at gigs? No longer! 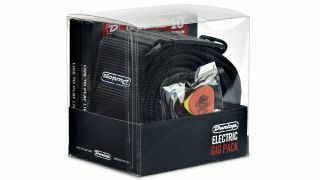 Dunlop has released the Gig Pack, an all-in-one accessory pack for electric and acoustic guitarists. The packs include strings, slides, plectrums and straps, but you'll have to provide the guitar, talent and audience yourself. For more information, visit the official Dunlop website. Musical accessory kings Dunlop are taking guitarists from the bedroom to the stage with a pair of Gig Packs for acoustic and electric guitarists. Like all Dunlop's gear, these new packs are top quality, reliable, and durable, so they're just what you need to keep the action going gig after gig, night after night. The Dunlop Acoustic Gig Pack includes three sets of Dunlop acoustic light strings (gauge 12-54), an elastic heavy single capo, chrome slide, and a variety pick pack, while the Dunlop Electric Gig Pack includes two sets of Dunlop electric strings (gauge 10-46), a black webbing strap and a variety pick pack. With everything a player needs to get up on stage with confidence, these packs should be essential purchasing for all six-stringers, so make sure you check them out the next time you visit your local guitar store! Dunlop is distributed in the UK and Eire by John Hornby Skewes & Co. Ltd. For more information, visit the JHS website.